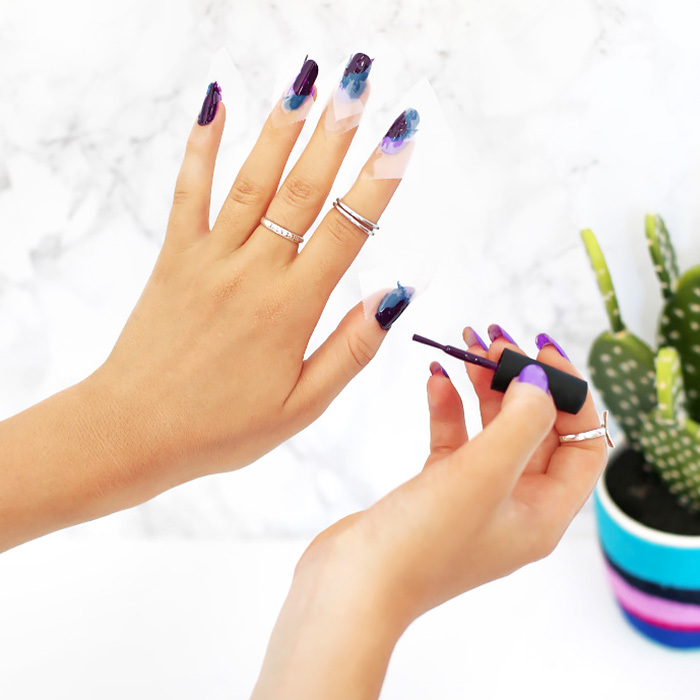 Getting a bit bored of your current mani? 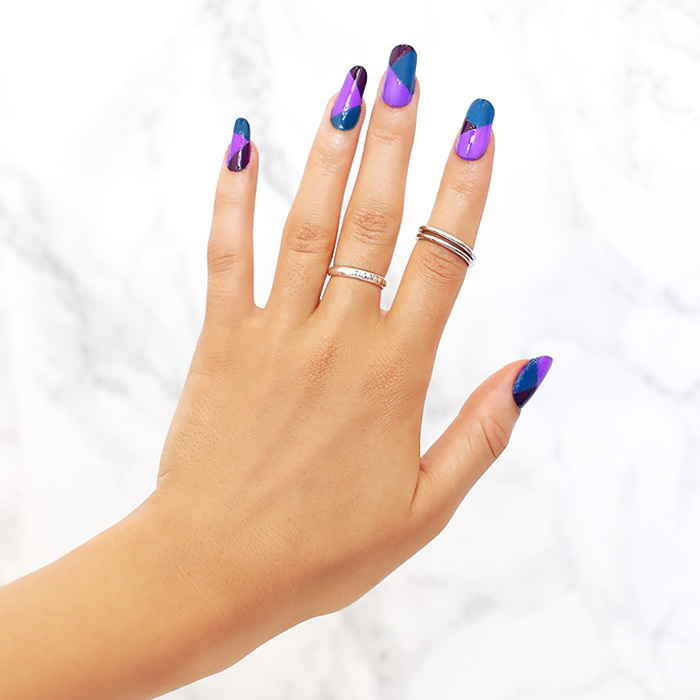 Here at BBHQ we thought we would mix things up and show you how to create your very own colour blocked manicure- no fancy equipment required! 1. A minimum of 3 shades of nail polish. We went with our favourite Kester Black nail polishes in the delicious shades of Deep Violet, Cerulean and Bougainvillea. It is important to start any mani make-over with clean and smooth nails. So if yours are not up to scratch (excuse the pun) we recommend giving them a quick file and buff. Using a light colour of your choice, give your nails a quick base coat. We used Bougainvillea by Kester Black. Apply a second coat if required and allow your base coat to fully dry before continuing on to step number two. Tip: Due to the layered design of this manicure you need to allow a LOT of time for each layer to dry fully before the second coat. So why not invite your besties around, and watch your favourite chick flick whilst you are all waiting for the paint to dry! With a general plan of how you would like your design to look, start applying the sticky tape in various diagonal arrangements across your fingernails working on only one hand at the time. Smooth the tape onto your nail to remove air bubbles. TIP: Remember the part of the nail you cover will remain the base coat colour. Carefully apply your second colour of choice to the sections not covered by the sticky tape.Take extra care to apply the polish right to the edges of the nail, it is ok if you paint over the tape. Continue painting all your nails. Depending on your design arrangement and the affect you would like to achieve you can either remove the sticky tape and then add another layer in a new direction or you can apply the sticky tape in a second layer over the top of the existing tape. Note: You can try and paint each nail the same (difficulty rating: high) or make it random like we did (difficulty rating: easy)! You can also mix it up and add as many layers as you like giving you the option to create a simple or busy design! Paint your final colour in the un-taped sections. Carefully and slowly remove the sticky tape to reveal your design. Note: Some tapes will leave a sticky residue that you can try and remove with soapy water once the polish is dry. Clean up your finger tips by using nail polish remover & the cotton buds. Then finish your nails by applying a clear top coat, this will help create a smooth and shiny finish. Now go and show off your new fancy digits!! !